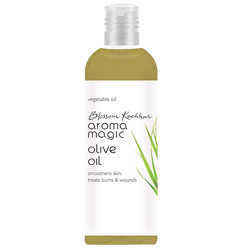 Buy Aroma Magic Olive Oil Smoothens Skin, Treats Burns, Inflammation, Arthritis, Wounds & Dehydration. A thick fruti oil extracted from olives, that delivers multiple beauty benefits apart from having nutritive value in your diet. When combined with essential oils, ideal for massages. Being full of vitamins, minerals and proteins, act as the perfect moisturiser for dry skin. Stimulate the process of skin healing and am useful for treating burns, inflammation, arthititis, wounds and dehydration while keeping the skin firm and toned. Being rich in healthy fats and phenilic antioxidant Vitamin E along wit oleic acid help in repairing the damage caused due to exposure to the sun.